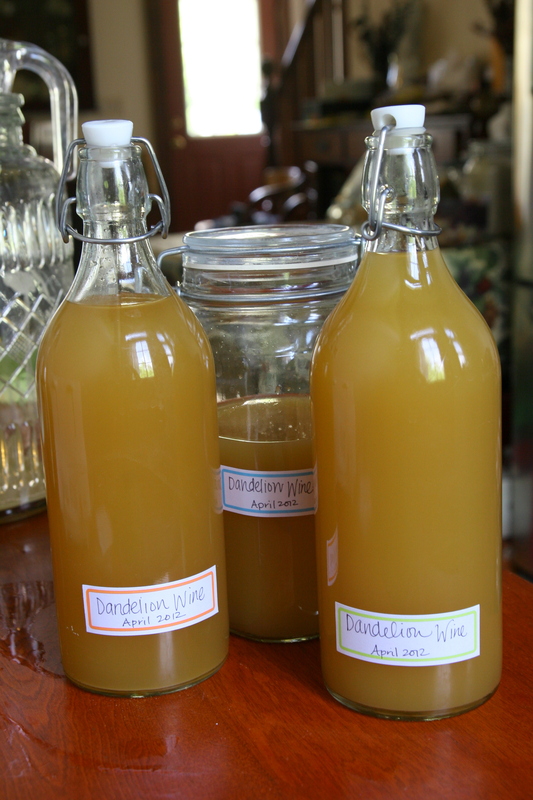 After letting our Dandelion Wine (read the first post here) age and ferment for a few weeks, a few days ago it was time to bottle it! A quick recap: First step is to steep the dandelion blossoms for a few days. Next, boil the liquid with orange and lemon zest, then strain and add sugar, yeast and some raisins. This we allowed to ferment for a little over a week. 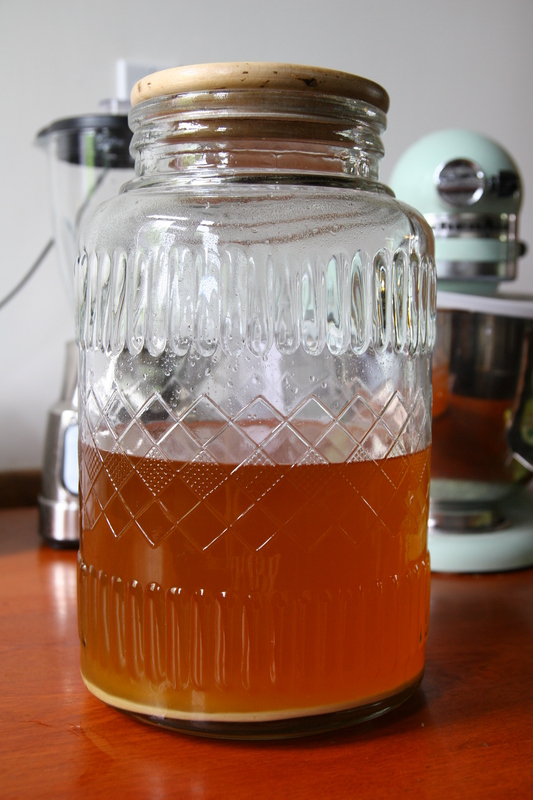 Then we strained that into a glass jar and let the whole deal mellow for a few more weeks, allowing it to clarify. The final stage was to bottle it. I initially tried to siphon the liquid out of the jar into the bottles. This was a disaster. I couldn’t get the liquid to start through the tube, and started spilling sticky wine all over the table…and worst of all, the sediment at the bottom of the jar was disturbed so it started clouding up again… I opted for the safe method: strain it again. Generally, it did work well and I managed to get most of the wine from the jar into the bottles, and avoid mass-spillage. Of course, we only had 2 “bottle” sized vessels, and the remainder went into a clamp lid mason jar that I used to use for sugar. It’s only half-full, so I’m hoping that’s not a problem….anyone know? All in all, it was a pretty fun little experiment. 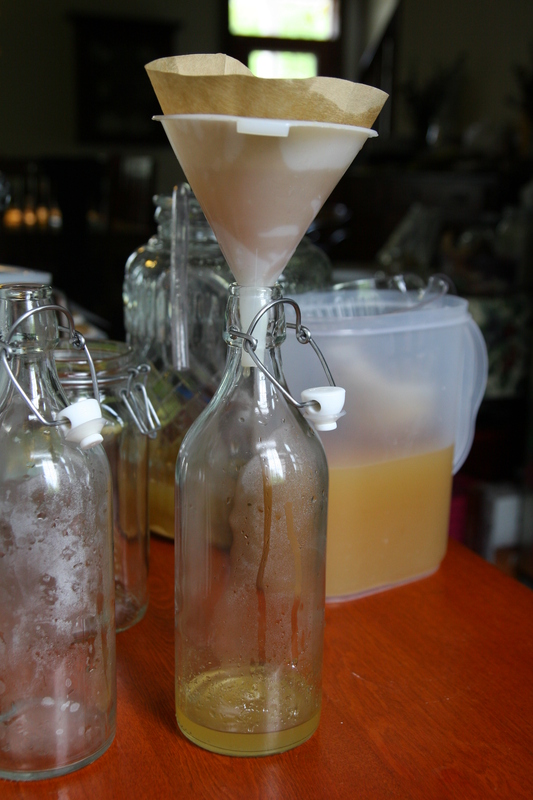 I realized that people who make homemade wine have all these gadgets and filters and siphons and bottles and corks and all….which I don’t have, nor do I particularly want to buy at present. Hence, this may be our last experiment of this sort for awhile. Unless, of course, this turns out to be extremely delicious, in which case we may have to try out parsnip wine this fall…..